U.S. Government map of Egypt. 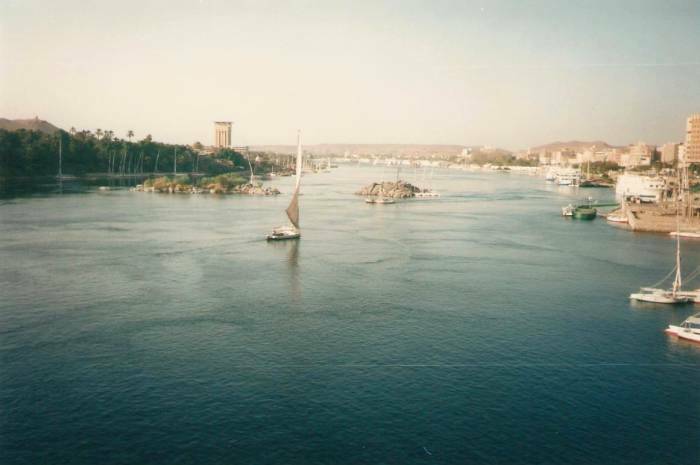 Aswan is at the First Cataract of the Nile, the first waterfall as you go up the Nile, several hundred kilometers from its mouth at the Mediterranean. 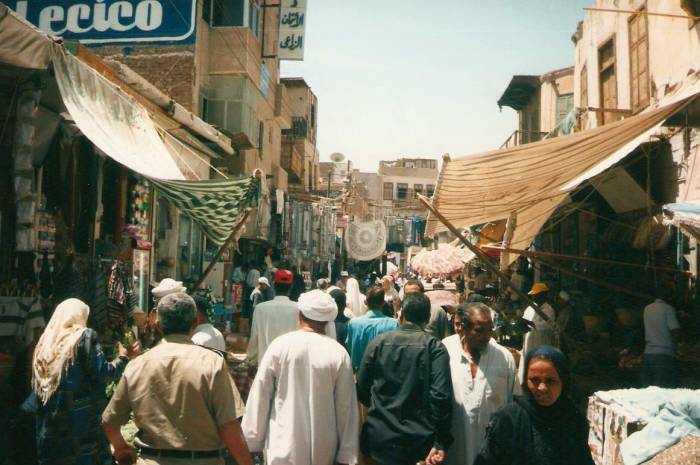 Aswan was known as Swenet to the ancient Egyptians. In Coptic, derived from the language of Pharonic Egypt, it's Ⲥⲟⲩⲁⲛ or Swān. The Greeks called it Συήνη or Syene. 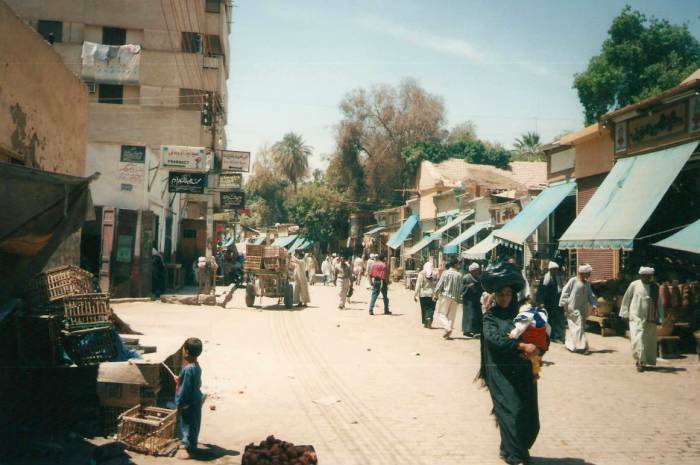 The First Cataract was the southern edge of the ancient Egyptian empire, Swenet was the border town. Tolls and customs were imposed on transport boats passing in both directions. The many rock quarries in the area supplied stone, especially the granitic stone known as Syenite, for large statues and obelisks found throughout Egypt. Aswan happens to be almost on the Tropic of Cancer, leading Eratosthenes to use it as one of his measurement points (along with Alexandria) to calculate the circumference of the Earth. You're also at the last place where heiroglyphs were known to be used. A priest carved a hieroglyphic inscription into the Gate of Hadrian on the island of Philae at Aswan on 24 August 394 AD. After 3,000 years of use, that inscription was the last one as far as we know. Knowledge of how to read and write hieroglyphs was lost over the following centuries. We only recovered that knowledge in the late 1700s and early 1800s using the parallel texts of the newly discovered Rosetta Stone. 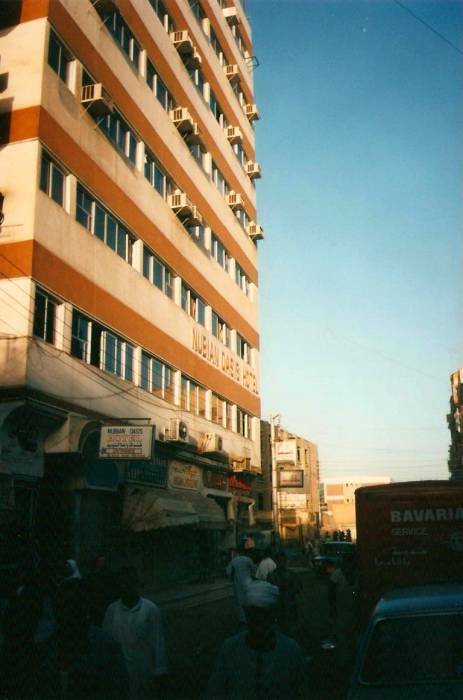 Here's where I stayed — the Nubian Oasis Hotel. A single room with shower and toilet, plus overhead fan and air-conditioner (! ), and a decent breakfast, was 15 E£ (US$ 4.40). Their phone number is +20-097-312126 and/or +20-097-312123. Walk straight out from the train station toward the Nile. 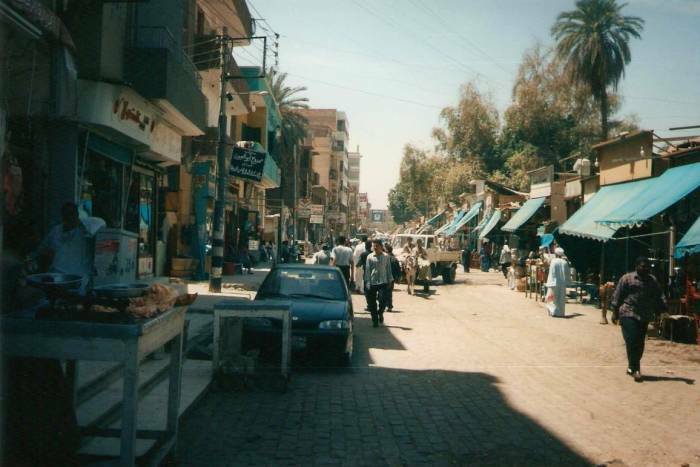 About 100m from the station door, turn left on Sharia Abtal al-Tahrir, which is the first street past the entrance to the Nubian bazaar immediately on your left. About three and a half blocks along the left you'll pass a bus station (which may consist of no more than a collection of pickup trucks). Take the next left, before you reach the French Roman Catholic church. The Nubian Oasis should be just ahead on the left side. 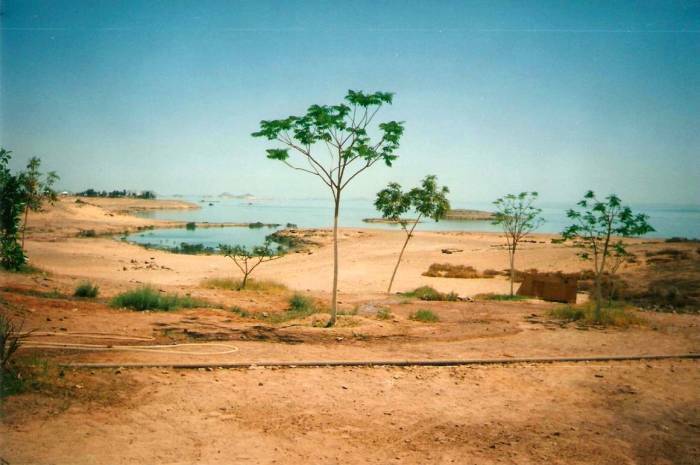 From Aswan, if you didn't think that was pretty much the ends of the Earth already, you may be able to take a bus 280 km through the Libyan desert to Abu Simbel, about far enough south to see Sudan in the haze over the reservoir. It's hot there — over 43C (110F) when I visited, and that was in May. The desert road is closed from time to time due to what are described officially as "security problems", but seem to really be an inability (or unwillingness) to keep drifting sand off the road. 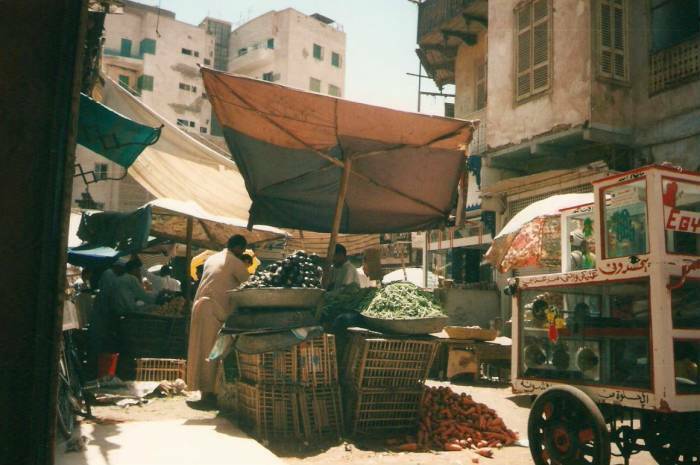 If the road is open, the Nubian Oasis hotel organizes trips out there. You leave about 0400 so you're there before mid-day. And thus get to ride back across the desert in mid-day, and no, the van is not air-conditioned. There is an airstrip near the site, some people fly in just for a short visit, flying in from Aswan or even from Luxor or Cairo. 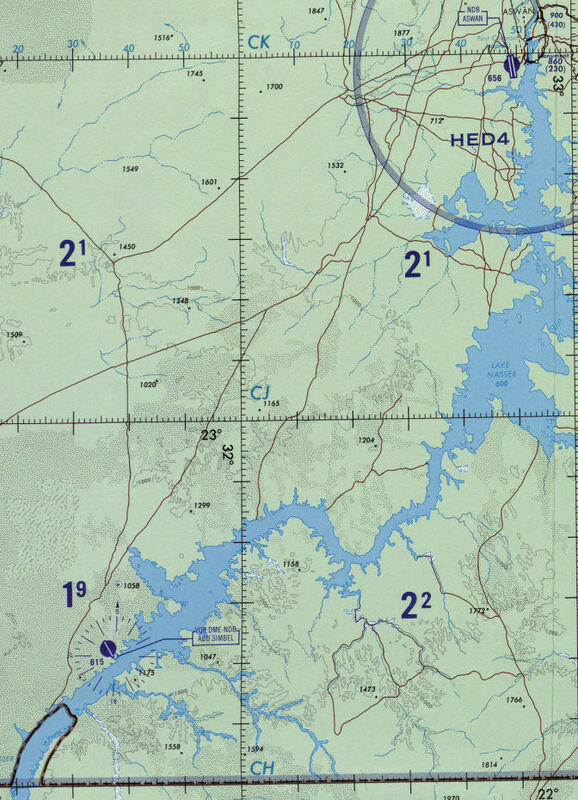 Here you see a small segment of the ONC H-5 chart at full resolution, from the Perry-Castañeda Map Collection at the University of Texas. 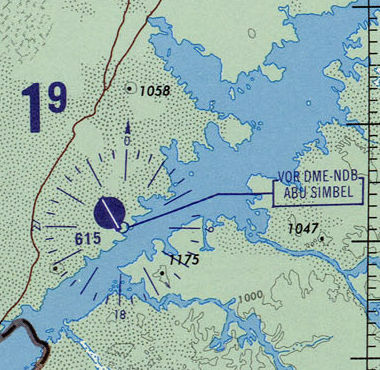 The dark dash-dot-dot line seen here and in the larger segment at right is the Sudanese border. 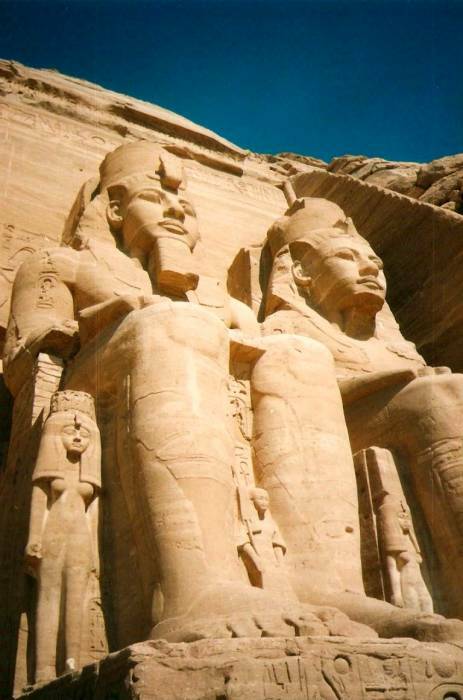 The temples were carved into the mountainous bank along the Nile during the reign of Pharaoh Ramesses II during the 13th century BC. It was to be a lasting monument to him and his queen Nefertari, and to commemorate his victory over the Hittite forces in the Battle of Kadesh, along the Orontes River in today's Syria. This is the earliest battle for which we have recorded details of tactics and formations, and with something like 5,000 to 6,000 chariots involved, was probably the largest chariot battle ever. Ramesses II claimed victory, although it was followed by a southward retreat of the Egyptian forces and a corresponding expansion of the Hittite Empire. Meanwhile, he was building this monument to himself in the opposite direction from the center of his empire, in order to indimidate the Nubians to the south and to reinforce the practice of the Egyptian religion in the region. The desert sand was starting to cover the statues by the 6th century BC, and the temple complex was soon forgotten entirely. It was rediscovered in 1813. In the 1960s the Soviet Union was building the Aswan High Dam for Egypt. The reservoir it created would back up hundreds of miles into Sudan and cover many ruins. 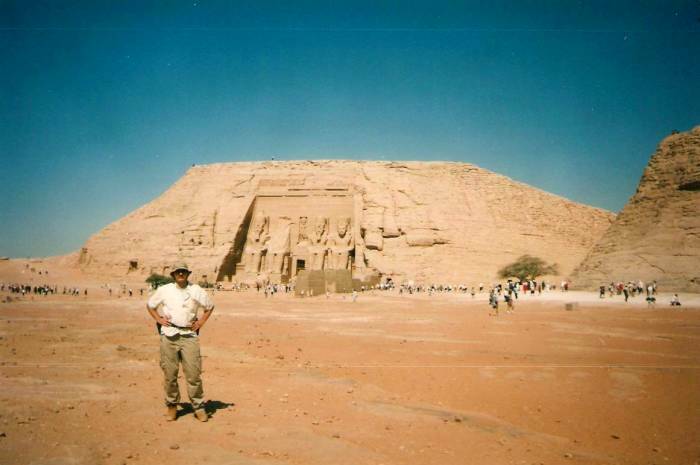 UNESCO, with loads of U.S. funding, disassembled and relocated a number of temples, including Abu Simbel. 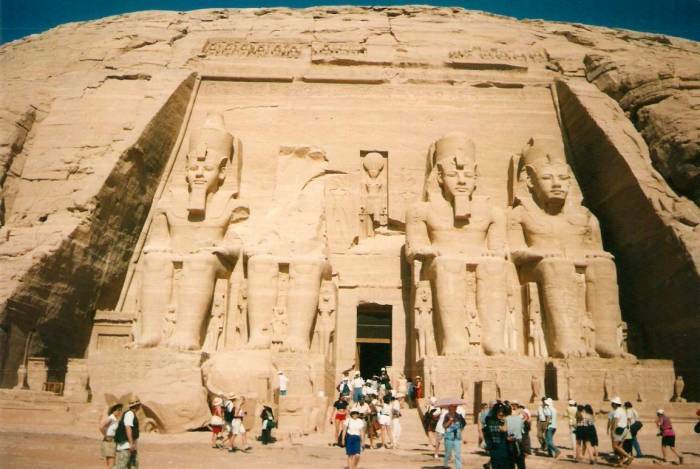 The Abu Simbel temple complex was originally carved into a cliff face along the Nile bank down in a valley. Now it's up beside the Lake Nasser reservoir on the edge of the desert, backed into an artificial domed hill. I don't think you can quite see Sudanese territory from Abu Simbel, but it's not too far over the horizon. 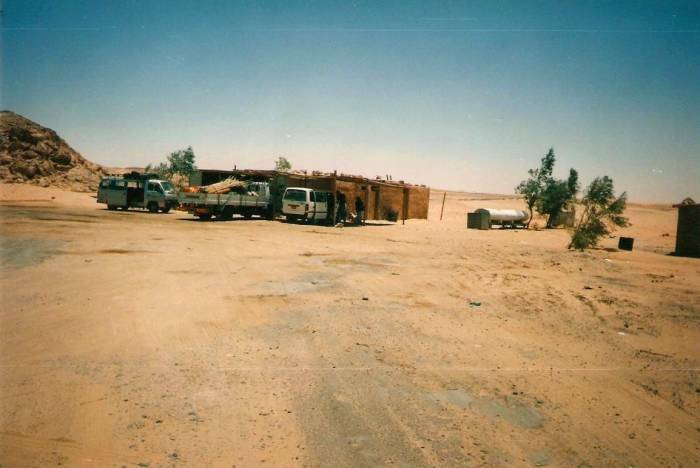 This truck stop is the only thing on the 280 km road through the Sahara Desert between Aswan and Abu Simbel. 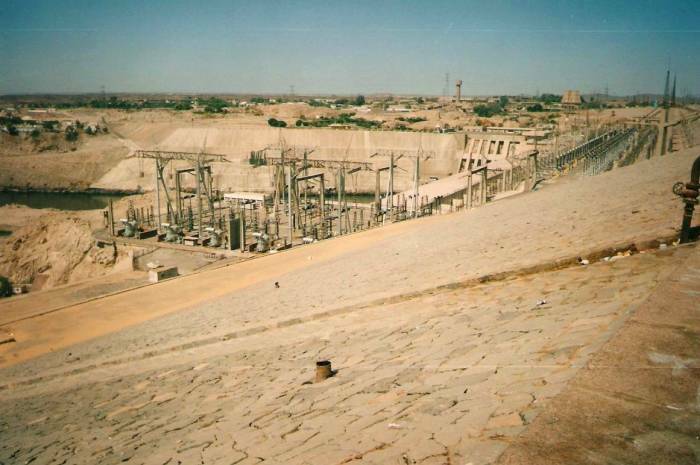 The Aswan High Dam was built by the Soviet Union for Egypt as some large-scale geopolitical hydroelectrical baksheesh. It's enormous — 3,830 meters long, 111 meters tall, and 980 meters wide at the base and 40 meters wide at the top. Twelve 175 megawatt generators put out a maximum total of 2.1 gigawatts. 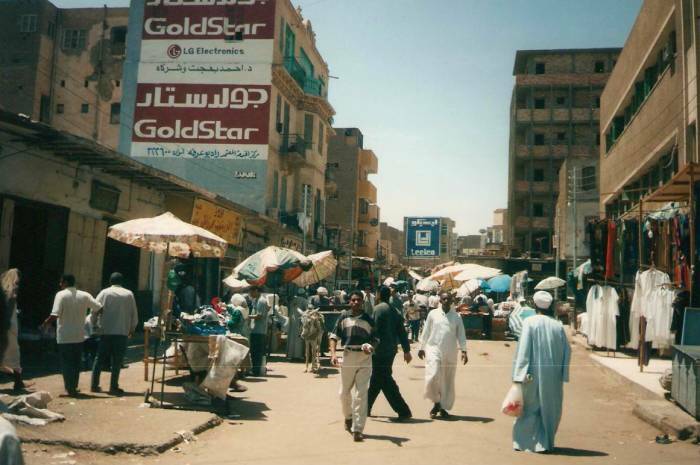 When first brought on line in 1967, that was half of Egypts entire electrical production. Now it is about 15 percent. While the dam provides electrical power and regulates water flow, avoiding the annual flooding (which was used for agricultural purposes since antiquity), there have been continuing environmental problems. Sediment is now captured behind the dam, filling in the reservoir, and leading to coastline erosion of 125-175 meters per year along the Nile Delta. The nearly constant water table level between the dam and the delta has led to significant increases in soil salinity and decreased crop yields. The standing water in irrigation canals supports snails carrying the bilharzia parasite. It also appears that Mediterranean fishing yields have decreased with the decreased supply of sediments from the Nile. Finally, the significant drop in river water sediment means clearer water, greater penetration of sunlight into the river, and along with increased flow of fertilizer nutrients into the river, increased growth of algae. This increases the cost of treating drinking water.